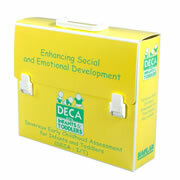 Engage – Use daily routines to interact with infants and toddlers. Coo, babble, and talk together during diaper changes and mealtimes. Share laughs as you play together on the floor. This everyday interaction not only helps children grow and develop, they are also learning how to get along with others by sharing smiles, words, and gestures. Describe Emotions – Use your face, your tone of voice, and your words together to express emotions: "Casey, you seem so happy. Look at my big smile. Your face is smiling, too!" Even if an infant or toddler is not using many words yet, hearing you label how he or she feels will help him or her learn to express feelings in healthy and safe ways. 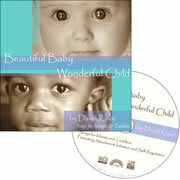 Redirect – Gently guide infants and toddlers to a better choice when needed. 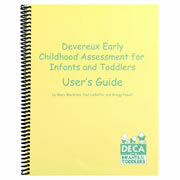 Young children often need redirection for their own safety. If an infant or toddler is moving toward something in the environment that is not safe, adults should remove the item or redirect the child to something more interesting. Infants and toddlers are curious—they seek to touch, taste, and smell almost everything. Keeping the environment safe is an important job for both parents and caregivers. 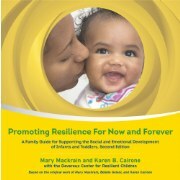 Promoting Resilience For Now and Forever is a great guide to give parents as you help them support their children's social and emotional health at home. 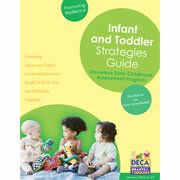 Browse our Infant and Toddler section for a variety of learning materials, supplies and equipment, and teacher resources you can utilize in helping infants and toddlers grow and develop. "Attachment: What Works" from CSEFEL (Center for Social and Emotions Foundations for Early Learning) is another great resource you can use to learn about attachment.